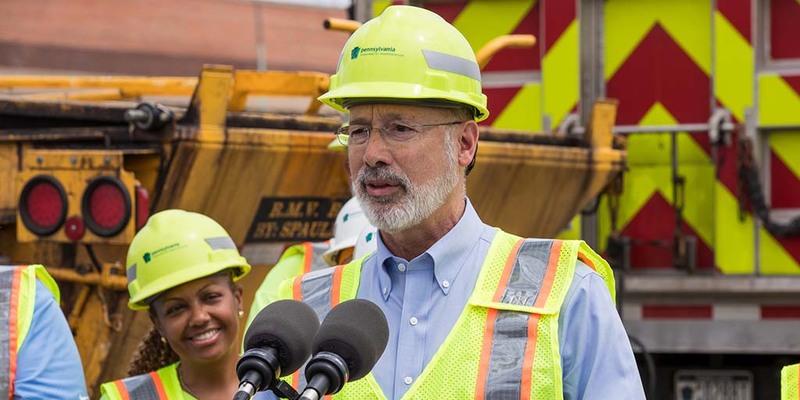 Pittsburgh, PA – Today, Governor Tom Wolf was joined by Pennsylvania Department of Transportation District 11 Executive Cheryl Moon-Sirianni to discuss the details of Resurface PA, the administration’s new statewide initiative to accelerate repaving work on interstates and attack potholes across Pennsylvania. Following a long winter season with dramatic temperature swings, last week the governor announced that PennDOT is mounting an aggressive campaign to accelerate repaving work on interstates and attack potholes. A significant part of the work will be financed using savings from other projects since the governor took office. Governor Wolf directed PennDOT to dedicate as many resources as possible to pothole and pavement repairs. The department has prioritized $22.3 million for immediate pothole repairs statewide through June 30, which translates into nearly 30,000 tons of patching material. An additional $7 million will be invested in seven interstate maintenance projects covering potholes and other repairs on 78 miles of roads this year. Together, these commitments will make 17 interstate paving and preservation projects covering 255 miles happen at least two years sooner than scheduled, with projects beginning this year and next year. These accelerated projects, which will preserve the pavement surfaces for at least five to six years, build on the 85 interstate projects covering more than 775 miles that are underway or expected to begin or finish this year. Through the end of April, PennDOT crews had used nearly 23,000 tons of asphalt repairing potholes statewide, equal to the weight of roughly 1,500 PennDOT dump trucks. In comparison, by the same time in 2017, PennDOT had used 15,418 tons of asphalt and 14,673 tons in 2016. PennDOT has spent more than $17 million on pothole repairs statewide through the end of April this year. With Pennsylvania’s aggressive freeze-thaw cycle, roadways will always experience potholes. PennDOT crews are working vigorously to repair pothole damage on nearly 40,000 miles of state-owned roadway, addressing higher traffic roadways first and working on others as soon as possible. Earlier repairs were temporary because long-lasting asphalt is not available until the weather warms and asphalt plants open operations. Motorists can report potholes and other highway-maintenance concerns on state routes at www.customercare.penndot.gov or by calling PennDOT’s toll-free hotline at 1-800-FIX-ROAD (1-800-349-7623). Join the conversation on social media with #PotholePatrol. Visit PennDOT on Facebook at www.facebook.com/pennsylvaniadepartmentoftransportation and Instagram at www.instagram.com/pennsylvaniadot, or visit us on Twitter at @PennDOTNews.